BAHRAIN – Brigadier General Shin Kyoung Soo, Republic of Korea (ROK) Army, deputy director general for policy, ROK Ministry of National Defense, visited the headquarters of Combined Maritime Forces (CMF), June 20. Brigadier General Shin Kyoung Soo, Republic of Korea (ROK) Army, deputy director general for policy, ROK Ministry of National Defense, center-left, visited the headquarters of Combined Maritime Forces (CMF) to discuss ROK contributions to the 26 nation partnership. 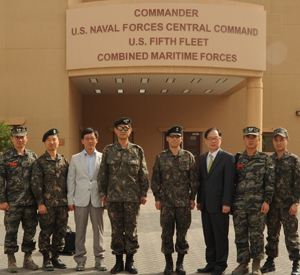 His visit also came after Rear Adm. (Lower Half) Anho Chung, ROK Navy, took command of Combined Task Force (CTF) 151, CMF’s counter-piracy task force, June 18. CTF 151 is one of three task forces under control of Combined Maritime Forces (CMF), based in Bahrain. CTF 151 was established in 2009 to deter, disrupt and suppress piracy, protect maritime vessels of any nationality and secure freedom of navigation for the benefit of all. CTF 151’s area of operation is in the Gulf of Aden, Indian Ocean, Red Sea and Somali Basin. Combined Maritime Forces (CMF) is a multi-national naval partnership, which exists to promote security, stability and prosperity across approximately 2.5 million square miles of international waters, which encompass some of the world’s most important shipping lanes.